(Care2) – I can’t think of any woman who’s a mother who wouldn’t respond in the affirmative to the question “is motherhood a full-time job?” There are certainly women who are able to be full-time mothers, but many, (myself included) must work. Many of us (myself also included) like working and, for all the demands of juggling a career and caring for children, we are glad to do it. But it is true, one does appreciate knowing that one’s efforts to do not one but two jobs are acknowledged. Venezuela, a country that has been making the news for a shortage of toilet paper, is providing mothers with a benefit quite unheard of (certainly in the U.S.). Under the country’s new labor law, full-time mothers will be able to collect a pension. The Chavistas’ new labor law gives “recognition to non-salaried work traditionally done by women,” Thomas Ponniah of the David Rockefeller Center for Latin America Studies and the Department of African and African-American Studies at Harvard University writes in ONTD Political. Ponniah’s explanation of the rationale behind a decision that American women can only dream of (if that) has to do with the efforts of the Chavistas to continue “struggle against inequality” and to work towards economic redistribution. Gender inequality is certainly one form of ongoing inequality in society. As Ponniah writes, redistributing resources is not sufficient to break down inequality because it ignores the “crucial role that identity and diversity play in society.” That is, who we are plays a huge part in where we are on the social hierarchy. Simply providing those who have historically been economically disenfranchised is not enough to create a truly equal society or, at least, one seeking to be as equal as possible. How this policy will play out in Venezuelan society remains to be seen. If it is known that a woman who is a full-time mother will receive a pension, might husbands and families use this law as reason to discourage or even prevent women from working? Still, I find the paying of pensions to full-time mothers intriguing. Placing a specific monetary value on motherhood challenges the notion that “being a mother is priceless; it’s the sort of thing that one could never put a price tag on.” While I am glad to know that being a mother is esteemed so valuable, it is often conservative thinkers espousing “traditional family values” and that it is better for women to stay at home in the house who offer such views. Currently the U.S. ranks in the same category as Liberia and Papua New Guinea in how little it provides in the way of maternity leave. 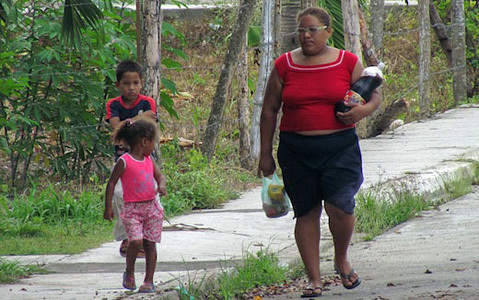 Venezuela has the world’s third-longest maternity leave, providing mothers with six weeks of pre-natal leave and twenty post-natal. Fathers may receive two weeks of paternal leave. Parents who adopt a child under three years of age can receive the same benefits. What can I say? When is the U.S. going to wake up and smell the coffee some mothers (myself) drink too much of as we go about our full-time work as mothers, teachers, lawyers and so much more?